Natural language processing (NLP) chatbots are artificially intelligent virtual assistants. NLP is the science of engineering computers to comprehend human language. NLP Chatbots are able to understand a consumer’s verbal or written instructions and then accomplish it on their behalf. Bots will fundamentally change how people interact with their devices and ultimately help drive efficient interactions. Instead of downloading a multitude of apps onto a smartphone and using each one to accomplish a specific task, a person will simply communicate their desire through their device or favorite messaging channel through speech or text. The NLP bot will then either convey the message to another domain-specific bot or directly invoke the appropriate back-end service to accomplish the request. For example, a consumer, such as Sarah, will no longer need to download apps, navigate screens and program instructions to hail a Lyft or to order a pizza. Instead, she will say “I need a ride home now, and I want a pizza delivered to my house in an hour.” Sarah can speak or type her request into her device via Siri, Google Now, Cortana and other NLP chatbots – or into Facebook, Skype, WhatsApp, Twitter and many other social channels that are currently building NLP chatbot capabilities. The chatbot will then work together with other chatbots, conveying the instructions across the network to the taxi service and the pizza delivery service. NLP Chatbots will be the future of device interaction. Asurion provides technical support and device protection for smart devices. The Asurion Virtual Assistant (AVA) is a natural language processing and machine learning-based chatbot platform that uses conversational dialogue to pinpoint the consumer’s technical support issues and then provide a step-by-step solution path to resolve the issue. By building and customizing a knowledge base and training it, AVA can be targeted to a specific product domain, such as customer service or technical support. AVA can provide a superior customer experience by enabling personalized solutions and leveraging device telemetry and analytics, 24/7, over any channel. The AVA ecosystem consists of: consumers, AVA bot engine, live agents, NLP models, computer readable knowledge base and personalized user data. Consumers initiate a conversation with AVA via multiple channels: PCs, tablets, mobile devices, SMS, chat and social messaging (e.g., Facebook Messenger, Twitter, WhatsApp), and voice (e.g., Amazon Echo, Google Home). 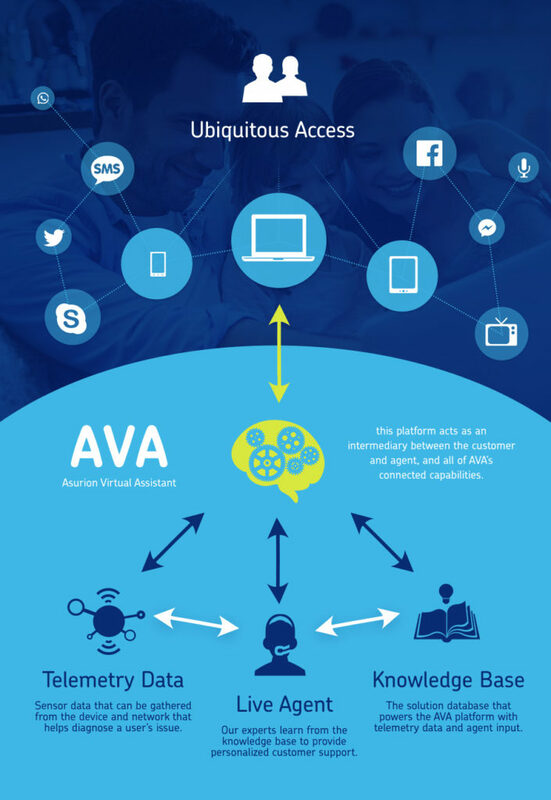 AVA enables ubiquitous tech support, 24/7, from any channel that the consumer uses. AVA bot engine is the orchestrator within this ecosystem. It uses the NLP models to understand the sentence phrases provided by the consumers and asks questions to validate the consumer and to diagnose the issue. For common questions, it can provide solutions to the consumer directly. Live agents benefit from a virtual assistant that helps agents pinpoint the issues and trains them in the right things to say. AVA can guide the agent to the right answers in our vast knowledge base of solution steps and videos. It can train the agents in the right way to handle the issue as well as the right things to say on behalf of Asurion and our partners. NLP models are generated by training the system to understand sentences for a specific domain. A world-class knowledge base (KB) housing human/machine readable content. Once AVA understands the problem, it uses the KB to solve the problem. This will be a fundamentally different KB that can be analyzed and used by both people and machines and will be available to both agents and consumers over multiple channels. User/Device information provides demographic information and account information about consumers as well as device telemetry and demographic data.